In terms of the cabinet pecking order, Danny Alexander might end up the most senior politician to lose their seat on polling day. 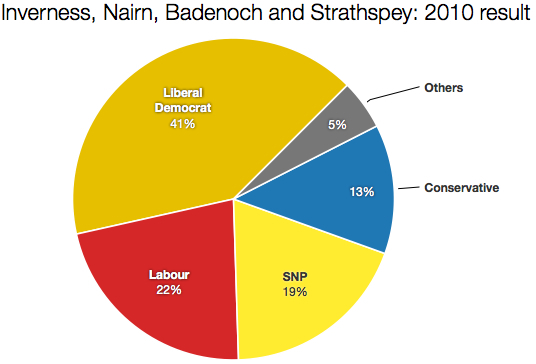 The Treasury chief secretary has a majority of 8,765 in Inverness, Nairn, Badenoch & Strathspey. But that’s a majority over Labour. The SNP came a close third in 2010, a total of 10,369 votes behind Alexander. If the Labour vote collapses in Scotland in the SNP’s favour, and if the Liberal Democrats do as bad as opinion polls currently suggest, Alexander will be in real trouble. To defeat Alexander, the SNP needs to achieve a swing of around 11%: a hefty task. But it’s not as big as some of the swings implied by the latest polls of voting intention in Scotland, all of which show the Lib Dems in low single figures, down from the 19% they scored at the 2010 general election. Alexander’s constituency covers two seats for the Scottish parliament. One, Inverness and Nairn, has always been solid SNP territory. The other, Skye, Lochaber & Badenoch, used to be a Liberal Democrat seat until 2011, when it was won for the first time by the SNP. The SNP also gained the neighbouring Scottish parliamentary seat of Caithness, Sutherland & Ross at the same election. At the time of writing, the Election Forecast website gives a 77% probability of the SNP winning Danny Alexander’s constituency. He is not the only senior member of the government at risk in the election. Education secretary Nicky Morgan in Loughborough and employment minister Esther McVey in Wirral West would be defeated on a moderate swing to Labour. But Alexander outranks them both in terms of political status, being one of the so-called “quad” of individuals who coordinate policy across the government (the other three being David Cameron, George Osborne and Nick Clegg). A chance of ousting such a high-profile symbol of the coalition is one that would enthuse the SNP on a grand and potent scale. The party would relish the challenge and no doubt pour money and resources into the campaign. It has yet to select a candidate, but the leader of Highland council Drew Hendry is among those to have put their name forward. Danny Alexander now has a serious fight on his hands. Defeat would bring twin costs: loss of his seat, but also no opportunity to take part in a leadership contest to replace Nick Clegg. A “senior Lib Dem strategist” has already told the Daily Telegraph it will take a miracle for Alexander to survive.